Netgauge is a high-precision network parameter measurement tool. It supports benchmarking of many different network protocols and communication patterns. The main focus lies on accuracy, statistical analysis and easy extensibility. See README file in package! If something is wrong with the high-precision timer (e.g., frequency scaling invalidates the results), MPI_Wtime() can be selected at configure time by passing "HRT_ARCH=6" to configure! 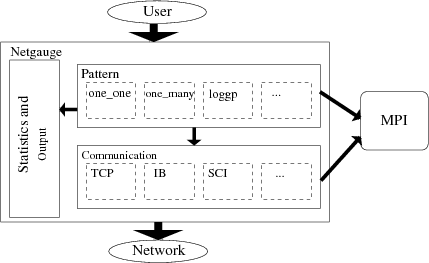 Netgauge is developed in the Computer Architecture Group at TU Chemnitz and the Open Systems Lab at Indiana University. Many students contributed to netgauge, see the "Authors"-file in the distribution. 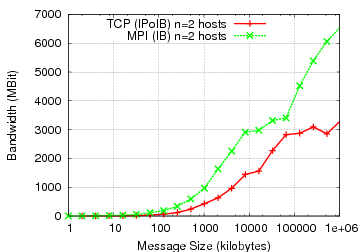 support many networks and patterns "out of the box"
The variable P is used to represent the number of nodes in MPI_COMM_WORLD! 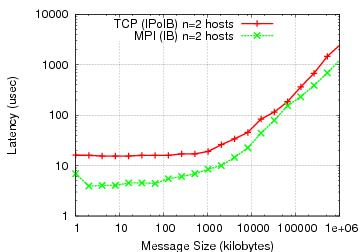 meas_o - measures the overhead in the pLogP model as described in "Fast Measurement of LogP Parameters for Message Passing Platforms"
loggp - measures LogGP parameters with the method described in "Low-Overhead LogGP Parameter Assessment for Modern Interconnection Networks"
Different communication modules for many networks are available out of the box. Many of them are experimental which means that the implementation is not well tested. Netgauge is a research tool, so users should expect errors (patches are generally welcome). The internal interface of Netgauge is two-sided. Thus all one-sided operations are "mapped" to two-sided operations. The scheme is depicted in the following figure. The module is supposed to issue the one-sided data-transfer and after that increment a counter on the remote receiver side. The network has to guarantee that those two operations do not pass each other! Both partners keep track of the appropriate peer's counter values.